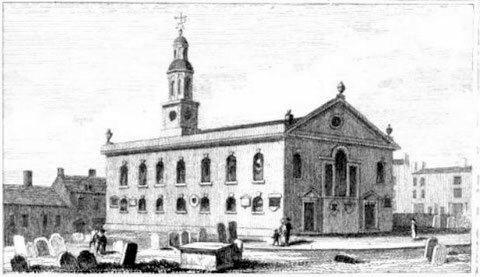 St Bartholomew’s Church was an early neo-classical church built on the edge of the town in 1749. Standing at the centre of the Jennens’ family’s proposed housing estate, it was designed to be a focal point for the new residents. Above: Image from William Hutton 1783 'A History of Birmingham' 2nd Edition - no longer in copyright. See Project Gutenberg to download this book - http://www.gutenberg.org . 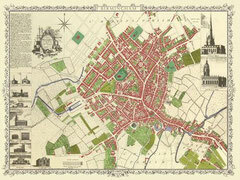 Above: Hanson’s map of Birmingham 1778. Image courtesy of the Mapseeker website - http://www.mapseeker.co.uk/ - reuse permitted for non-commercial purposes. 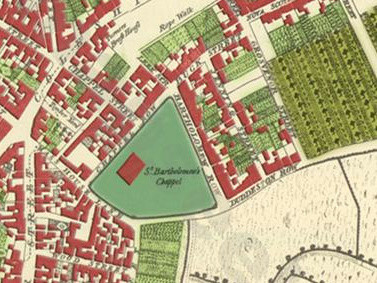 St Bartholomew's Church also appears on the 1890 Ordnance Survey map available at British History Online - http://www.british-history.ac.uk/mapsheet.aspx?compid=55193&sheetid=10098&ox=2534&oy=948&zm=1&czm=1&x=549&y=227 . St Bartholomew’s was built on the site of the Birmingham Masshouse. In 1687 James II had issued the Declaration of Indulgence in which he negated the effect of laws which restricted the freedoms of Roman Catholics and Protestant Dissenters. 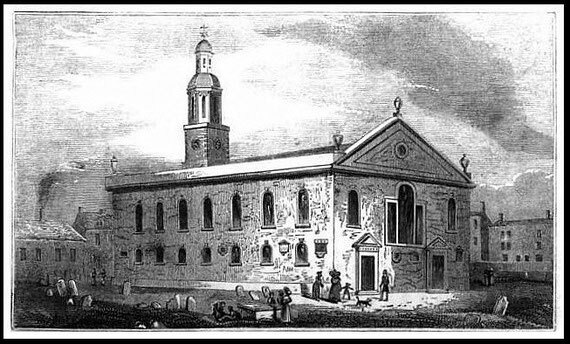 Encouraged by this, Catholics in Birmingham built the Mass House in 1687 with a dedication to St Mary Magdalen and St Francis. The King himself gave the proceeds of 125 tons of timber towards its construction. The next year the foundation stone was laid of a Franciscan convent adjoining the Church. Above: Image from Beilby Knott & Beilby 1830 'An Historical and Descriptive Sketch of Birmingham' - out of copyright. See Google Books to access this book - http://books.google.co.uk . By the 18th century the land here on the eastern edge of the built-up town was in the hands of the very wealthy Jennens family, ironmasters of national importance. In common with other landowners on the rural fringe, the Jennens set out to develop their estate for middle-class housing. The population of Birmingham was increasing rapidly at this time. From a population of 5500 in 1660 numbers rose to over 23 000 by 1731 and to some 31 000 by 1770. During the 18th century Birmingham became the third most populous town in Britain after London and Bristol, and while the national population increased by 14%, the population of Birmingham increased by 900%. St Martin’s, the parish church of Birmingham was not able to cater for the number of people wanting to worship there, or for the number of burials. At a time when pews were rented, there was standing room only even for wealthy newcomers. Having seen the impact of the building of St Philip’s in the High Town, John Jennens saw that a new church at the centre of his new estate would be sure to attract affluent newcomers. The site was given by Jennens, whose wife also gave £1000 towards the building of the church. The rest of the sum, some £250 was raised by subscription, the subscribers being guaranteed a sitting, a rented pew in the church. The church was set up as a chapel of ease of St Martin’s in a proto-parish of only some 40 hectares but with a large graveyard. It had t John the Baptist in Deritend, this was considered inappropriate. 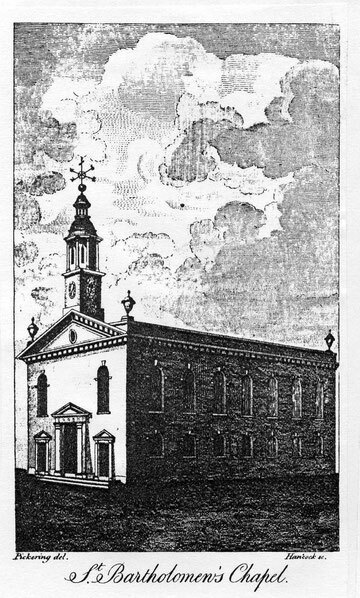 The church, which opened in 1749, was built of brick with stone dressings in a neo-classical style and was rectangular in plan. It is thought that the brothers, William and David Hiorne were the architects. The church had gabled ends, with an ornamental urn at each angle of the plain parapet. There were three pedimented doors at the west end; above the larger one in the centre was a small clock-tower surmounted by a cupola and weather-vane. The church was built to accommodate a congregation of 800. It is a neat brick building, handsomely fitted up with-in, having a nave and two side aisles, with galleries, and a good organ. The altar-piece, ornamented with excellent carvings of fruit and flowers, was the gift of Basil [6th] Earl of Denbigh; and the communion-plate, consisting of 182 ounces, that of Mary Carless. . . . At the western end is a turret, with a clock and one bell. When built, the church stood on the eastern edge of the town, on land that had been arable fields and small allotments, but houses soon grew up around it. By the end of the century the church in the middle of a well populated area. However, the proximity of the estate to the canal and later the railway and goods yards saw a fairly rapid decline in the middle-class status of the district as housing became interspersed with warehouses and industry. Image from William Hutton 1836 'The History of Birmingham' 6th Edition - out of copyright. See Google Books to access this book - http://books.google.co.uk . 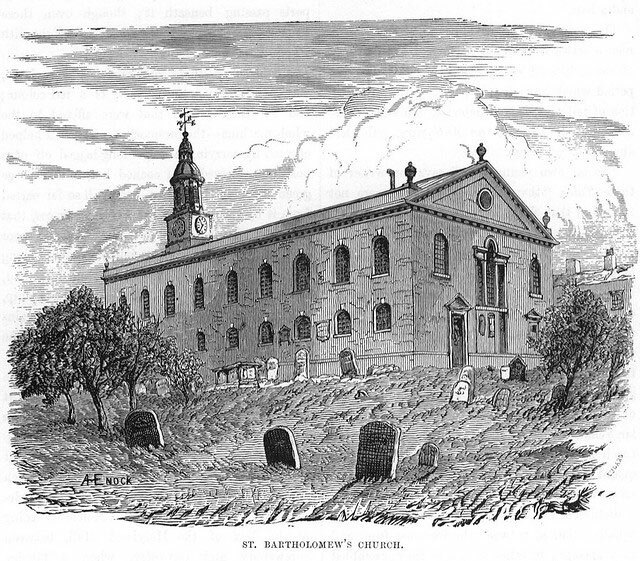 St Bartholomew's became a parish church in 1847 with a parish assigned out that of St Martin's. By 1888 the character of the area was changing and the church and the preference was now for churches in the gothic style. Surrounded for very many years by a barren-looking graveyard, the huge brick-built edifice was very unsightly, and being close to the Park Street burial ground it was nicknamed "the paupers' church." Since the laying out of the grounds, however, it has much improved in appearance. By this time there was room for a congregation of 1800, 1000 of the seats being free. The church was restored in 1893. The organ was installed in 1806 and seems to have been frequently used early in the 19th century for musical performances. James Kempson, aged 20, became the choir master and clerk at St Bartholomew’s in 1762 and raised funds through musical concerts there for ‘aged and distressed housekeepers’. He was involved in the creation of the Musical & Amicable Society, a group made up of the choirs of St Bartholomew’s and St Philip’s, who enjoyed singing and drinling together. In 1766 he formed the Choral Society and later the Chapell Society to raise funds for charity. By 1920 the regular congregation had dropped to some 50 members. The vicar undertook an innovative venture to attract people to the church by installing a cinema screen to b used one night a week. The first showing attracted some 500 people, but the venture failed that same year. The cost of entrance tickets did not match the considerable outgoings needed to run such a project. St Bartholomew’s closed in 1937 and its small parish was split between those of St Philip, St. Martin, St. Gabriel and Bishop Ryder. In 1942 the building was badly damaged by a German bomb; it was demolished the following year, except for a fragment of the east end and the east window. The much-admired 17th-century carving in the chancel depicting cherubs, fruit and flowers was taken to Christ Church, Yardley Wood. Some of the oak panelling was installed in the Lady Chapel of St Mary's Moseley. By 1961 the last vestiges of St Bartholomew’s church had disappeared completely and the site was in use as a car park. Image from R K Dent 1878 Old & New Birmingham from sally_ parishmouse on flickr - http://www.flickr.com/photos/parishmouse/3668755427/in/set-72157604068779488 reusable under Creative Commons licence Attribution-NonCommercial-NoDerivs 2.0 Generic (CC BY-NC-ND 2.0). There is some incidental information about St Bartholomew’s on St Paul’s Church website - http://www.saintpaulbrum.org/twonewchapels.pdf - in an article by John Sawkill 2010 “An Act for building Two new Chapels and providing Burial Places thereto, within the Town of Birmingham, in the County of Warwick”.